In the final days of World War II, with Germany's frontlines collapsing into chaos, Willi Herold, a German private separated from his comrades and desperate for food and warmth, comes across an abandoned car with a suitcase that contains an SS officer's uniform. Trying on the uniform like an actor adorning himself with a costume, Herold assumes the role of "Captain Herold" when another deserter happens upon him. Lost and without hope, he takes this new identity conferring great authority as a stroke of good luck – a chance to survive. 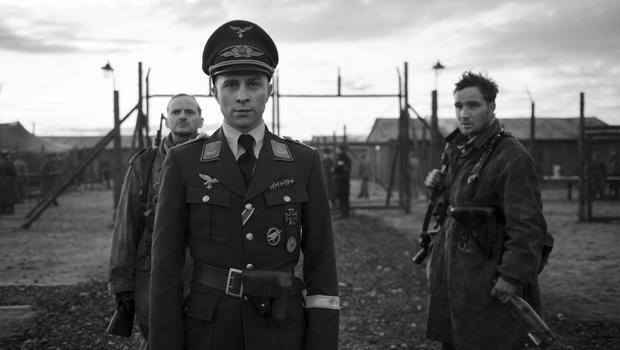 But instead of simply using his new persona to evade military police and mollify villagers bent upon killing looters, Herold becomes a personification of the Nazi regime, upending the German army's bureaucracy and establishing himself as a force to be reckoned with when he initiates a brutal wave of atrocities, claiming to operate under the personal instruction of Adolf Hitler himself. He becomes the character of Captain Herold with relish. And as he acquires a small band of fellow renegades who commit murder and execute scores of prisoners in a detention camp, other German officers look up to Herold as an exemplary symbol of the state, at a time when their defeat by Allied forces seems all but certain. But the uniform is also a danger to Herold – being somewhat ill-fitting, it potentially could expose his charade if someone had too discerning an eye. Is he that good an actor to pull it off? The consequences of failing this improvisational act are too grave. "The Captain," a new film from German director Robert Schwentke (best-known for his Hollywood thrillers "RED," "Flightplan," and entries in the "Divergent" series), is based on the true story of the fake officer whose atrocities earned him the nickname "The Executioner of Emsland." In addition to being a suspenseful tale of desperation amid the collapse of the Third Reich, it is also a deft portrait of a masquerade in which the process of acting reveals the depths of one man's immorality and corruption. Shot in exquisite black-and-white, Schwentke's film stays close to the protagonist (played cunningly by Max Hubacher) who takes center stage as he melts, like an actor, into his role. And like an actor, Herold completely obviates himself (and all the personal responsibility and ethics he might carry inside) as he realizes for the first time true power. As a study in survival, "The Captain" shows the allure of a despotic strongman to those who are mired in fear, and the use of fear to assert even greater control. It also shows how ephemeral such power is. The film's depictions of violence, while chilling, are also abstract enough to appear the projections of an actor convincing us of his character's authenticity. Hubacher does a credible job playing someone trying not to appear in over their head, at a time when everyone was in over their head, with regards to being on the losing side of a war. Schwentke doesn't go in for explaining or rationalizing Herold's behavior beyond mere opportunism, but his narrative does suggest that a template of brutal military power is extremely easy to adapt to, when the alternative is to be quashed. The most arresting scene of the film actually takes place under the closing credits, when the flagrant abuse of human dignity by the Nazis is dramatized in a manner that finds such attitudes tellingly germane to the present day. The abuse of power, sadly, doesn't disappear once the guns of battle grow silent. "The Captain" (distributed by Music Box Films) opens in New York City Friday, and in Los Angeles August 10. Not Rated (contains war violence and sexual content). 118 mins. In German with English subtitles. To watch a trailer for "The Captain" click on the video player below.